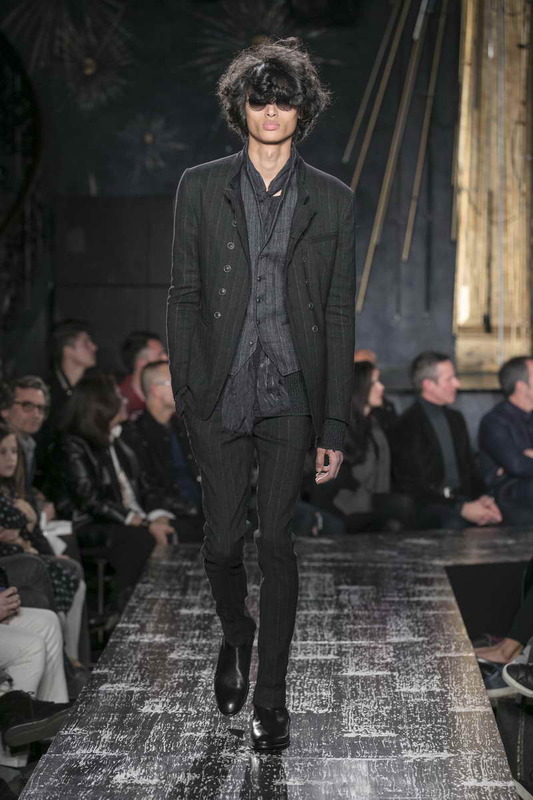 The urban romantic man, mused on the duality of effortless elegance, is brought center stage in this Fall/Winter 2017 Collection to reveal his most mysterious and inscrutable traits. Initiated down the runway is a nonchalant conceptualization of styles embodying both a rich history and an ever-evolving present. As the story builds, these characteristics become increasingly more transcendent, diverse and complex. The “Wild at Heart” lineup reflects a consistent penchant for old-time craftsmanship and perfectly-reckless demeanors, intensifying a profound sense of adventurousness that shows no sign of being tamed. The result is a repertoire of refined-rebellion, translated through a sartorial composite of archetypal styles undone by subversive punctuations. 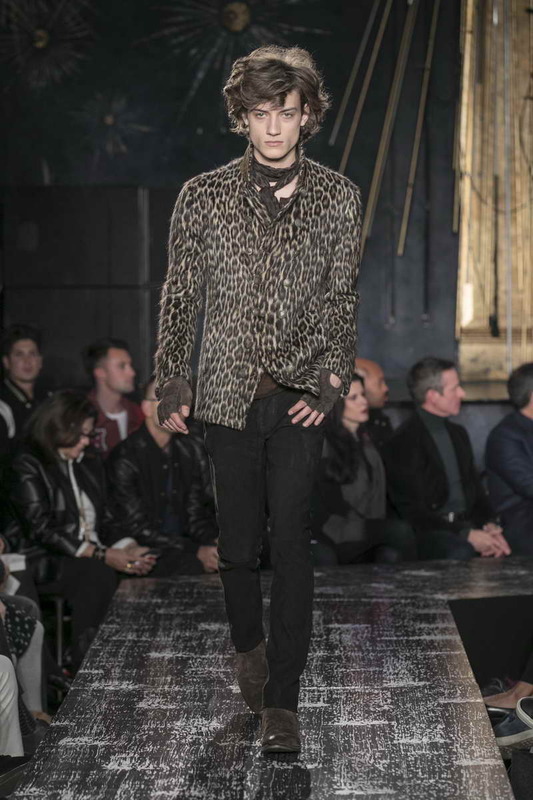 Supple leathers, exotic animal- inspired fur finishes and washed velvets demand a major impact, accompanied by a propensity towards the inner-rebel with interior stylistic features escaping from within — shearlings turned inside out and exposed leopard print linings unveil an enigmatic new sentiment. The collection exploits these traits in an array of unexpected textures and treatments, alongside luxurious fabrics and pristine tailoring. 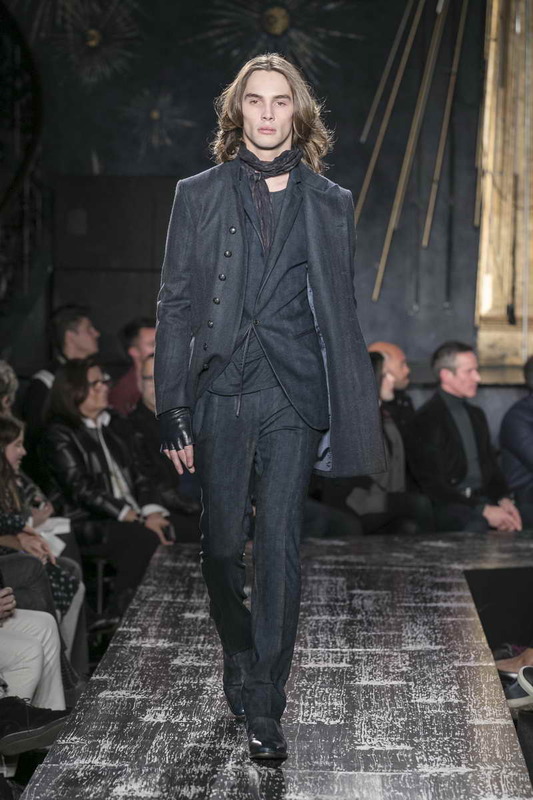 Dandyism details are showcased throughout, glinting in washed velvets from under collars and fine trimmings. Hand-burnished leathers, hand-painted treatments and exotic animal finishes are enlivened by a rich color spectrum — from classic black to pearl gray and charcoal tones, as well as officer’s blue, vicuna, chocolate, camel and dark olive. Coats dominate this season in a cascade of impactful finishes and thoughtfully- constructed weights, creating an array of intelligently layered ensembles. 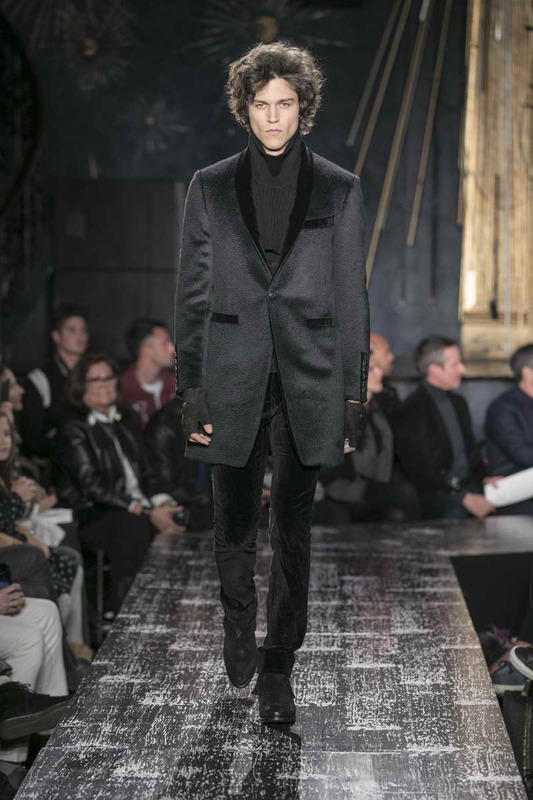 An alpaca-wool blend, single-button black coat with a velvet shawl collar is styled over a knit dickie and stretch leather pants, adding a darkly-elegant edge to a downtown look. In recognition of the aforementioned rebel self, a shearling coat is rendered inside-out, revealing a smooth interior and a shaggy exterior, which is further amplified by a defiantly long-haired fur appearance. The spotlight on interiors continues in a lusciously reinterpreted hooded parka that’s done in olive-hued washed velvet with boldly exposed leopard print lining. The Wild at Heart vernacular goes full force in animal-inspired motifs and standout leathers. 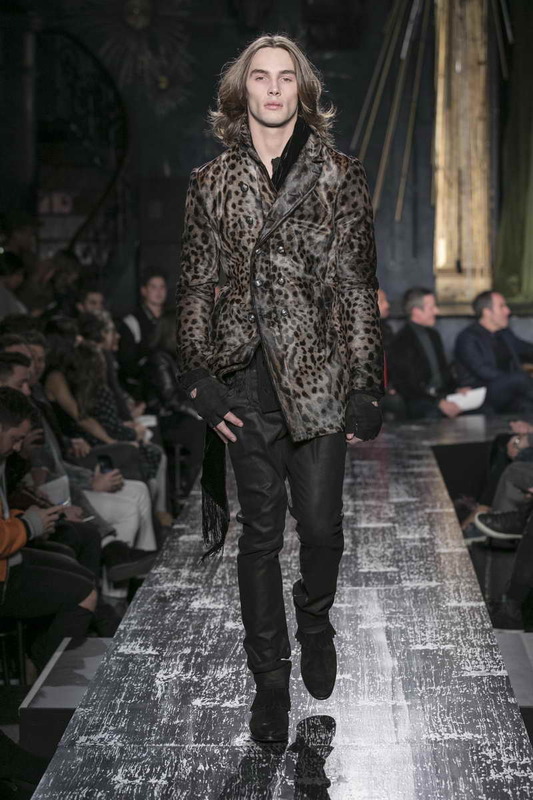 A striking lynx print calfskin builds vibrancy in an asymmetrical biker jacket, followed-up by a leopard print, rock and roll-esque top coat. Hand-stained, pony finish calfskin redefines the go-to moto silhouette, leading into a double-breasted wool and alpaca- blend jacket featuring a woven and brushed leopard print finish. Invigorating patterns are often complemented by non-restrictive stretch leather pants in smooth or dimensional two- tone suede finishes. Tonal stripes expose an interesting focus on juxtaposed fabrics, as seen in a cardigan and crewneck sweater of a tactile chenille and silk-mix. Textured shadow stripes make an appearance on an all-black alpaca, wool and cashmere coat, venturing also into an indigo- hued style accentuated with pleated, self-fabricated striping. An artisanal painting technique gives seasonal coats and jackets a new multi-dimensional look, creating a hand-painted striped effect with both subtle and defined appearances — ensuring ultimate softness without the stiffness typically associated with painted applique. Vintage-inspirations lend themselves to a single breasted, mixed-striped sport coat in blue hues worn atop a solid multi-button vest with irregular herringbone-striped pants. Double-breasted jackets are defined by antique brass buttons on a narrow button stance, a remarkable stylization that ensures form when worn properly buttoned or more casually opened — nodding to the collection’s penchant for day-or-night pieces. A classic wool and cashmere-blend fair isle sweater is distorted and brushed, creating a bursting pattern of both disruptive and artisan qualities. Tapping into a host of hand-finishes, washes and burnishing, footwear cultivates an individuality in concept and construction. Emerging this season is a fresh narrow-toed silhouette featuring statement zips and a unique kiltie adorning, which is easily removable for a keen sense of personalization. Key bags of the season include a calf hair lynx print messenger and slouchy day bag accentuated with supple leather straps and antiqued brass zips. Veritable bandanas and scarves are spun in lightweight modals, silks and wools, and velvets tipped with elongated fringed edges. Worn with a relaxed drape, a single knot or loosely tied to resemble a charming ascot-like effect, this diverse selection of scarves and bandanas brings a touch of poetic verve to even the most audacious looks. Emphasized in texture and character, the Fall/Winter 2017 collection gives the idea of nonchalant cool with an uncompromising devotion to elegance and boldness. A personality driven by free-thinking sensibilities and a refusal to become content with the norm. 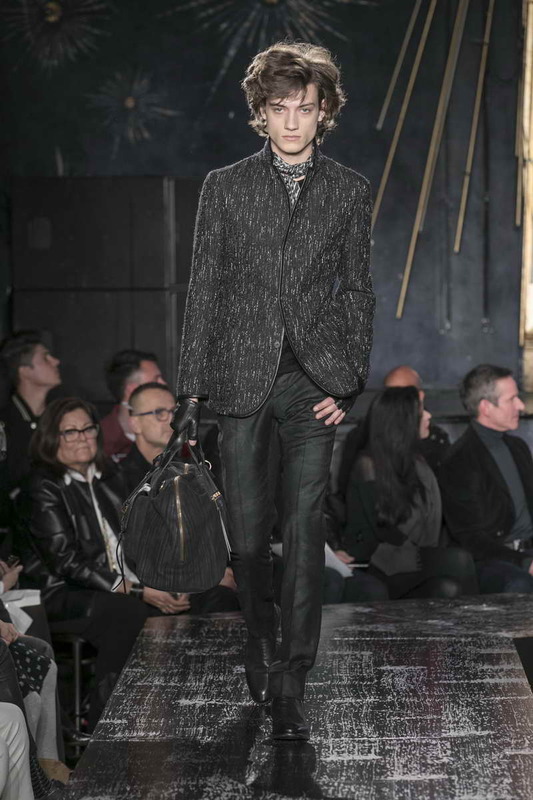 From statement animal-inspired finishes to dandyism details and razor-sharp silhouettes, runway looks march to the beat of their own drum while maintaining a connected mutability for layering and styling — proving the modern man’s heart does indeed beat wild.